Wraparound exists to serve families who need more help coordinating their care. The goal of Wraparound is to help kids, teens and young adults stay in their home, community, and/or school. Wraparound exists to serve families who need more help coordinating their care. The goal of Wraparound is to help kids, teens, and young adults stay in their home, community, and/or school. Wraparound utilizes a team of caring professionals, friends, and family who use standardized principles to meet the needs of families. Wrap creates a place to serve and coordinate services for families who work with multiple service agencies. For example: Juvenile Justice, Child Welfare, Schools, and Mental Health Agencies, etc. How do I Access Wrap Services? Our certified facilitator provides Wraparound services in the five surrounding counties: Clark, Garland, Hot springs, Montgomery, and Pike. It is most common of a child’s therapist to refer to the Community Care Director for services. For more information, please join us at our CCC meeting (held in conjunction with the SOC meeting detailed below) that is held once a month at OBHAW in Hot Springs. This meeting is designed to provide you an opportunity to meet other Wrap families and network with agency representatives from across our communities. Contact Community Care Director, Stacy Casbon, at (501) 304-6951 with any questions regarding Wraparound Services. We would like to invite you to our SOC meeting that is held on the 3rd Tuesday of every month from 10:00 a.m. – 12:00 p.m. at Ouachita Behavioral Health and Wellness in Hot Springs. This is your chance to meet our System of Care (SOC) committee and take part in the decisions that involve your Wraparound team and other Wraparound teams in our region. It is important to have your input so that we, as a committee will know what is working in our region and for our families. We look forward to having you join our council or visit us periodically. How does the Wraparound Process work? A referral is submitted by the child’s therapist. The Community Care Director reviews each referral to determine eligibility. If eligible, she will contact the parent/guardian to set up an appointment to complete the engagement process. At this time the parent or guardian will sign release paperwork, and provide proof of income. After this process is complete, the Wraparound Specialist will contact the family to schedule a wrap meeting. These meetings are held once a month for 90 days then every other month.. The parent/guardian, Natural Support, Therapist, Child, and outside agency must be present for each meeting. It is encouraged for the family to bring as many “natural supports” to the meeting as possible. Natural supports are considered anyone who is there to help in your day to day life. How long does the Wraparound Process last? What can Wraparound Services do for me? Each Wraparound Plan is individualized to meet the family’s needs. Each Wraparound Meeting is customized for that particular child. The entire team decides what the needs are and provides available resources for families to connect with. 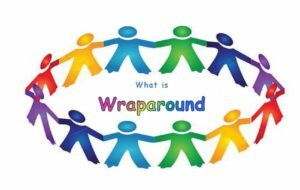 Wraparound has funds that are available but they are to be used as a last resort. Wraparound can NOT pay your overdue bills, fix your car, or buy you expensive toys. Referrals are not determined eligible if they based on financial needs alone.